This is a series of essays about LoLa’s history in its first decade. 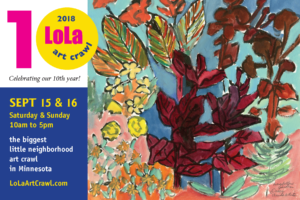 From our 2018 LoLa Art Crawl Featured Artist to other makers with deep ties to Lola, to more recent volunteer organizers, we will bring you profiles of our neighboring makers, friends and inspiring artists. Read our first profile and stay tuned for more. Anita White is the 2018 LoLa Art Crawl Featured Artist. Bob Schmitt is the second neighbor and artist we are featuring in the weeks leading up to our 10th Annual LoLa Art Crawl. 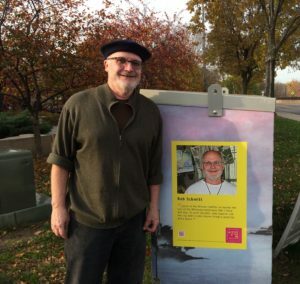 Bob has been a coordinating and creative instigator since LoLa’s beginning and and the experiences he reflects on in this profile reveal his affection for our neighbors and creative processes. Bob, thank you for your spirit, your effort, your studio and the art you bring to so many in the neighborhood! Bob Schmitt at a ‘I am a LoLa artist’ box.